sisu: When scientists "join in the political fray, where they really don't belong"
When scientists "join in the political fray, where they really don't belong"
"If you weren’t bright enough to do science, you could go into politics," Michael Crichton quipped in an "AEI-Brooks Institution speech awhile back. "I also come from an older and tougher tradition that regards science as the business of testing theories with measured data from the outside world. Untestable hypotheses are not science but rather something else." The left's oxymoronic scientific "consensus" on anthropogenic global warming comes to mind. 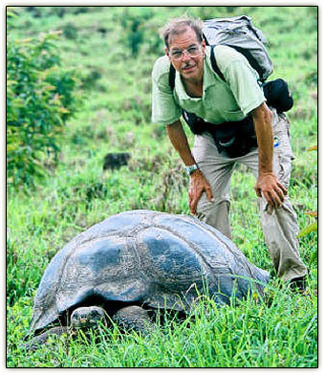 When people who ARE bright enough to do science -- like Dr. Frank J. Sulloway (posing above with Galápagos Giant Tortoise), who has "published extensively on the life and theories of Charles Darwin," including "Why Darwin Rejected Intelligent Design" -- "join in the political fray, where they really don't belong" and "where they do it really badly," observes Crichton, "they are damaging science as an enterprise." Previous psychological studies have found that conservatives tend to be more structured and persistent in their judgments. Well, yes. They stick to their principles.
. . . whereas liberals are more open to new experiences . . . "There is ample data from the history of science showing that social and political liberals indeed do tend to support major revolutions in science," said [Frank J.] Sulloway [a researcher not connected to the study], who has written about the history of science and has studied behavioral differences between conservatives and liberals. MoveOn.org has been working closely with the Democratic congressional leadership -- as an article in today's Sunday New York Times Magazine makes clear. And consider this comment by a Democratic senator from Friday's Politico: "'No one wants to call [Petraeus] a liar on national TV,' noted one Democratic senator, who spoke on the condition on anonymity. 'The expectation is that the outside groups will do this for us.'" Sulloway said the results could explain why President Bush demonstrated a single-minded commitment to the Iraq war and why some people perceived Sen. John F. Kerry, the liberal Massachusetts Democrat who opposed Bush in the 2004 presidential race, as a "flip-flopper" for changing his mind about the conflict. You're projecting again, Dr. Sulloway. Since you and your fellow liberals are so "open to new experiences," how about this one: Maybe the President's "single-minded commitment to the Iraq war" is a sign of character, while John Waffles Kerry's "perceived" flip-flopping betrays a complementary lack of character. As John McCain and Joe Lieberman ask rhetorically in today's Opinion Journal, "The president had the courage to change course on Iraq. Does Congress?" In yet another of their "objective" studies, New York University professors draw conclusions that make liberals look good and conservatives look bad. Two years ago in September of 2005, I decided to start blogging so that I would quit yelling at the television, newspaper and anyone else who would listen. The television's and newspaper's loss is our gain. In my opinion "liberals tolerate ambiguity and conflict better than conservatives" because their brains don't work. Their starving need to be the ones who know best and the ones who lead the pack rules their conclusions. As far as I can tell, liberals really are more willing to change their minds on an individual basis to the opinion of the local crowd. That doesn't mean the crowd changes its mind readily. I'd like to see the results of a study comparing liberal and conservative reactions to the Asch conformity test. Joseph -- In my experience, no group marches in greater lockstep to the party line than members of the leftist elites of academia and the media. I don't know that Conservatives "block" information so much as, they expect to have little things like facts used to support a reason for changing their minds. I'd as soon listen to Sulloway's opinion on such matters as stick my hand into a running garbage disposal. I knew the man some years ago, through a family connection, and he is one of the most arrogant and inflexible people I've ever met. This wind-baggery is typical of him. My late father cleared my mind permanently when he told me that "figures lie and liars figure". Haven't trusted a pollster since then!